Guests will wonder whether it’s a demon or just a running dishwasher behind closed doors. Creepy Devil inspired SPOOKY SPIRIT DEMON DISHWASHER DOOR COVER will scare anyone who comes into the kitchen. Frighten your guests this Halloween with this Spooky Demon Dishwasher Door Cover. Place this static cling door cover on your dishwasher to create the look of a spooky ghoul trying to escape. Scary Haunted House horror decoration measures approximately 30-inch by 30-inch (75cm square). The Demon Dishwasher Door Cover is the perfect addition to your Halloween party and can be used over and over. Use your own removable tape for extra security if desired. 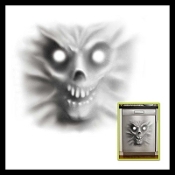 Devilish Demon also makes a ghoulish wall, window, ceiling or mirror mural poster for any Haunted House! Also a great touch for a Christmas Carol Ghost for a Creepy Christmas!! !